Warsteiner passion for creativity is expressed in many forms, from sport to music, up to contemporary art. During the conversation with the brand manager Silvia Serpelloni we discover the new-born Warsteiner contemporary art collection. Born in the middle of XVIII century in Germany, the well-known beer brand Warsteiner has always been a privilegiate relation with art, from the design of the first glasses in 60’s to the long-lasting sponsorship to many initiatives for promotion of music, sport and art. This year this 360° young and creative approach makes another step forward, acquiring three artworks during last edition of Affordable Art Fair in Milan, in which Warsteiner has been actively participating for three years. Vast, Lord Nelson Morgan e Filippo Mozone are the names of three street artists chosen by the historic German beer company to begin its contemporary art collection. We deeply talk with the brand manager Silvia Serpelloni about the many projects which Warsteiner is taken on, from art to energy research. Alessandra Ghinato: What is the values relation between Warsteiner and art world? Silvia Serpelloni: The eclectic spirit that characterizes the world of art is inspiration for Warsteiner, because let us express the flair and creativity, DNA of our brand. From more than 260 years, Warsteiner is involved to the art of making beer and represents an icon of passion, vitality and contemporaneity. The relation of Warsteiner with art world began in 60’s, when one of the most important German artist, Hermann Hoffmann, drew the typical beer glass Warsteiner Tulpe. Later, Andy Warhol immortalized it in one of his famous acrylic-digital prints and it entered in the legend. In these last years Warsteiner has been promoting the duo of art and young people activating many national and international initiatives to support the young artists. It wants to encourage the talents, the free expressions, the potentiality of young people. On this theme in Italy the brand has recently launched a spot with the claim “Do it Right”, that wants to boost young to follow their passions, such as art, and push them to do it at the best of their possibilities. A.G.: What are the projects you support? Silvia Serpelloni: In Italy we are collaborating for the last three years with the contemporary art fair “Affordable Art Fair”, one of the most innovative and active artistic stage of the moment. In these 3 years of collaboration we have grown and developed many activities to support young talents. This year for example we decided to acquire three artworks of three young artists to create the first “Warsteiner Collection”. Vast, Lord Nelson Morgan and Filippo Mozone are the young street artists, protagonists of the special award “Warsteiner Art Battle”, who had better interpreted the Wairstener attitude #doitright and had transformed the new spot, recently launched in Italy, in a piece of contemporary art. Among the international recent initiatives, from April 1st, we opened the subscriptions of “Blooom Award by Warsteiner”, a springboard to let the artists to freely express their creativity and gain visibility, with an unique spirit: valuing and supporting the emergent talents of worldwide art. A.G.: How your innovative Braukademie, the Beer Academy, was born? What are its goals? Silvia Serpelloni: The Braukademie, The Beer Academy, promotes the research and the innovative development in the pursuit of respecting the environment. It is a “minifactory” of beer inside the brewery Warsteiner, where, as in a laboratory, we make projects of research and further development of production precesses, for an up to date technology, flavour and quality. The Academy’s long-term goals include strategies to improve the energy saving, to optimize the mix of raw ingredients, such as hops, malt and water, experiment new technologies and products. By reducing the energy use and the emission of CO2 and optimizing the whole chain of processes, the Brauakademie Warsteiner, with the new thermoelectric station and the private railway of the company, represents a new milestone of the long-lasting responsibility of Warsteiner towards sustainable environment policy and innovative processes of beer production. A.G.: How Warsteiner Collection is composed? Can visitors have the possibility to see it? 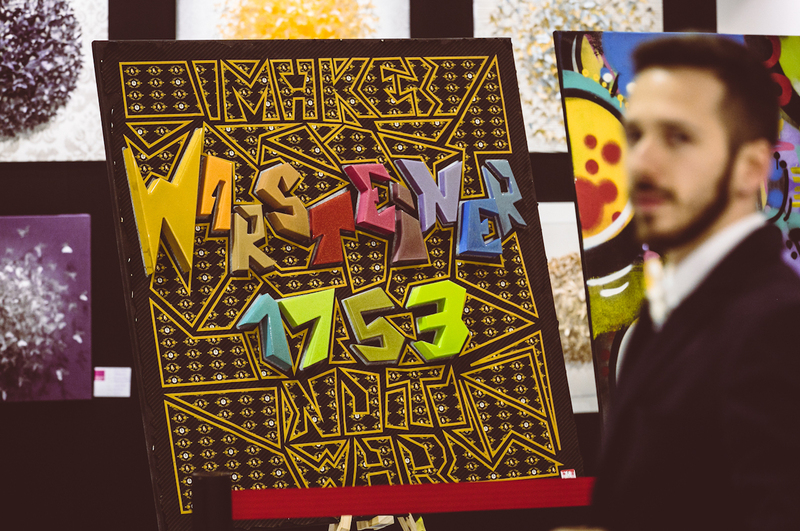 Silvia Serpelloni: The Warsteiner Collection was born with artworks of three young street artists to whom Warsteiner gave visibility during Affordable Art Fair. 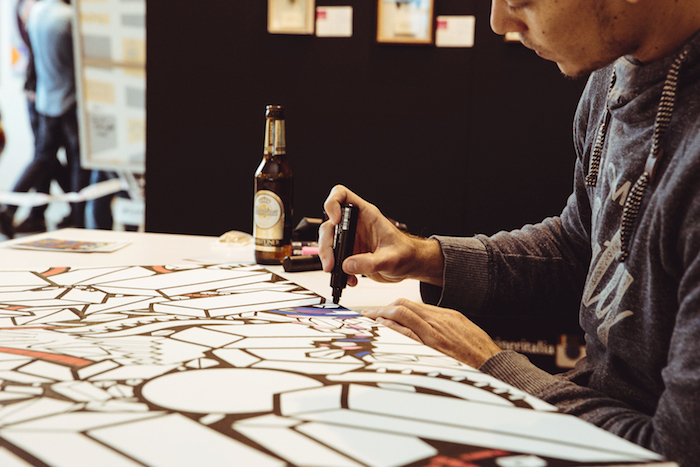 Their talent and capacities to interpret the attitude #doitright let them emerge between ten competitors of the special award “Warsteiner Art Battle”. The Warsteiner Collection artworks will be protagonists of an itinerant tour and will have as “favourite stage” the best Italian Warsteiner pubs. A.G.: Have you already though to catalogue your collection? Silvia Serpelloni: These are procedures we will fix little by little while the collection expands. To catalogue the first three artworks, we have at disposal the biographies of the artists with whom we are still in touch. A.G.: Do you pay attention to the authenticity of the new acquisitions? Silvia Serpelloni: We have requested to the artists the authentications and we keep all the materials about them. A.G.: Which is the balance of many years of collaboration with Affordable Fair? Silvia Serpelloni: The evaluation is strongly positive because this exhibition gives us the possibility to discover new talents and let them be known by the public through creative itineraries, such as for example the exhibitions of some their artworks in unusual trendy clubs. It is a young and innovative territory like our public, that has attention to beauty and news. We have the same passion of making well the things we like to do. As the beer… Do it right!